I read 153 page of Isla and the Happily Ever After yesterday and finished it, as well as completed my overall goal of reading 2 books for the read-a-thon! 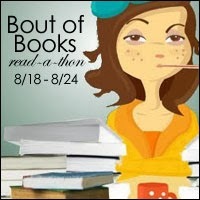 It's been a really great, and really fun, reading week, and I'd love to participate in Bout of Books again. Congrats on reaching your goal! You're about the 80th person to mention reading Isla and the Happily Ever After during Bout of Books. Apparently, I missed the memo. :) I'll have to check it out! Enjoy your last day of the read-a-thon! Was it good? I see it on IG a lot, pretty covers but it looks too bubble gum for my taste though. Congrats on meeting your goal! Thanks! The books in the series are on the lighter side, but I think they have a good amount of depth to them, too, particularly this last one. I was really hesitant to read Anna and the French Kiss, but it totally won me over. I love read-a-thons, they are the best! Congrats on meeting your goals and reading so much yesterday!! I was curious to see this film, but I keep thinking I need to read the book first! Thinking I might wait until it is out on DVD, that would give me time to read the book! It's a pretty quick read; I actually read If I Stay in one day because I had to return it to the library the next day and was out of renewals, lol. I'll definitely be buying the movie when it comes out on DVD; it was so, so good!